A Running Stitch to Create a Fabric Yo-Yo. In hand sewing, a running stitch is created by simply running the needle and thread through the layers of fabric without back stitching. You are sewing a straight line of stitches. These may be close together or farther apart. It is used for quick mending, basting, gathering, and small hand projects. It is also a stitch used in decorative embroidery. The running stitch can be seen on both sides of the fabric. A running stitch can make a quick mending job when you don't have time to thread the sewing machine. It also can be used to stitch on appliques or patches by hand. Basting joins fabric together temporarily. A running stitch is a common hand basting stitch because it is fast and easy to do and just as fast to remove. Very heavy fabrics can be easily basted together with a running stitch rather than fight with straight pins that can't get through the thick layers and bend or break instead of pinning the heavy fabric. The running stitch can be used to gather bulky fabric. However, machine basting is best for gathering lightweight garment fabric so that the gathers are smaller and extremely evenly spaced. 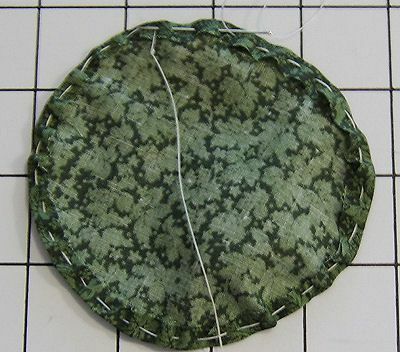 A simple project to practice sewing a running stitch and using it for gathering is sewing fabric yo-yos, which can be made into many yo-yo projects. Small hand projects such as sewing doll clothes or decorations might be done with a running stitch, especially in areas where it would be difficult to sew with a machine. You will need a needle, thread, and fabric to sew a running stitch. Thread the needle and knot the thread. Anchor the knot in the inside of the fabric in the area you will be sewing a line of running stitches. If sewing layers of fabric, align the edges. Place needle through the fabric and bring it back up to the top side from the bottom side of the fabric, weaving the needle in and out of the fabric. Repeat until the desired area is sewn. Anchor the thread in the inside of the seam or seam allowance and trim the thread. A running stitch is not a very secure stitch. If any of the individual stitches is snagged, it will pull the whole line of stitches and pucker the fabric. If the thread is broken or the knot comes loose, the line of running stitches will quickly unravel. That's what you want in basting, but not in seams and hems of items that will be worn and laundered. Instead, use a back stitch or slip stitch (also known as the blind stitch) for these purposes. To make the running stitch more secure, take very small stitches close together. In fact, this is exactly what a sewing machine is doing. It is actually producing a running stitch, but the stiches are small enough and close enough together to be secure.